Let our thoughts and prayers go out to the islanders of Vanuatu, who are recovering from Cyclone Pam. The BBC report that the official death toll currently stands at eight, but is expected to rise. Because of the vastness of the Pacific, most cyclones/typhoons either never make landfall, or do so at well below peak wind speeds. For instance, there have been 35 typhoons in the Western Pacific since the 1950’s with pressure of 895mb or less. Of these, only four hit land at Cat 5 strength. Such powerful cyclones are less common in the South Pacific, and more often than not miss vulnerable islands such as Vanuatu. In the last 20 years, there have been 10 cyclones, ranked as Category 5 on the Saffir Simpson scale in the South Pacific. According to NOAA, Cyclone Pam had maximum 1-minute wind speeds of 145 kt, or 165 mph, putting it in the top five cyclones in the region since 1989. Of these, Orson and Monica hit the Australian coast, while Zoe and Ron fortunately did not hit land at all. It is a sad fact that disasters such as this have happened in the past and will continue to do so in the future. For anybody who would like to help, Rotary New Zealand are calling for donations, which can be accessed here. 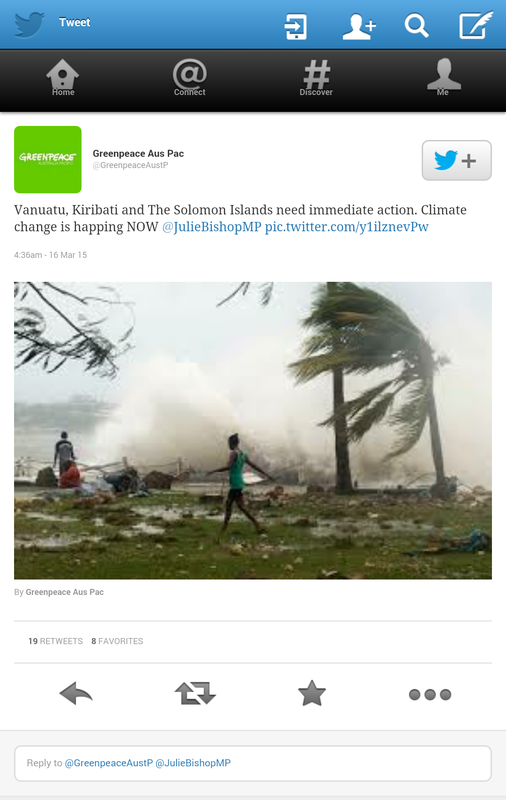 The president of Vanuatu has claimed that Climate Change is partially responsible. In this report, Roger Harrabin is surprisingly non committal. In 1973 typhoon Nora had a pressure of 877 mbar, wind speeds more than 170 miles an hour (source: Page 72 of the excellent book “Watching the Weather” by John and Mary Gribbin). As Paul says, most of these storms never hit land, so never get properly measured, so the sparse sampling of them means that it is highly likely that even stronger ones have occurred at sea. Low pressures in the 870s mbar have occurred before 1980, since then there have only been 880s and 890s, probably not significant, but certainly not an intensification, a fact strangely absent from recent reports. I agree, not only that but the actual normal wind speeds of Pam according NUSchool, which appears to be pretty accurate was 100km/h. Obviously that is not gust speeds. So I find it hard to believe that it was really a Category 5 Cyclone. The last 5 Cyclones have all been overhyped speedwise and when they have actually passed over somewhere that actually measures them at the normal ground level they are no where near the satellite measurements. Unfortunately for Vanuatu they have a lot of buildings they cannot cope with even the 100kp/h that Nuschool measured, being made of corrugated iron, Bamboo and thatched roofs. The more solid brick built buildings stood up to it much better. It means that as usual the poorest in the on average poor community have suffered the most. Let’s hope the World Nations can bring them some quick relief. Thanks for the information. In view of the real dangers of weather, it is unfortunate that world leaders have been less than candid about causes. I hope to post later today a second one-page sequel to Climategate to show how science was sacrificed in 1945 to save the world from possible nuclear annihilation. Professor Tim Palmer (Oxford University) claimed wind speeds of 200mph for Cyclone Pam on the Today programme this morning. He also said wind speeds had never been recorded of this magnitude. How come Paul can very quickly access data which de-bunks the claims of this “eminent” full time ,climate scientist who is no doubt being very well paid from the public purse – and why do the BBC let him get away with it? http://www.bbc.co.uk/programmes/b055fkb6 at about 2.38 into the programme. Yes, I heard the same programme. Humphries did actually raise the question of unreliability in climate models and mentioned ‘ten year – um – fifteen year pause in warming’ so he’s done his prep. Otherwise give us the money for bigger computers and we’ll produce more accurate models. I don’t think that journalist such as Humphrys will ever be able to take on climate scientists. 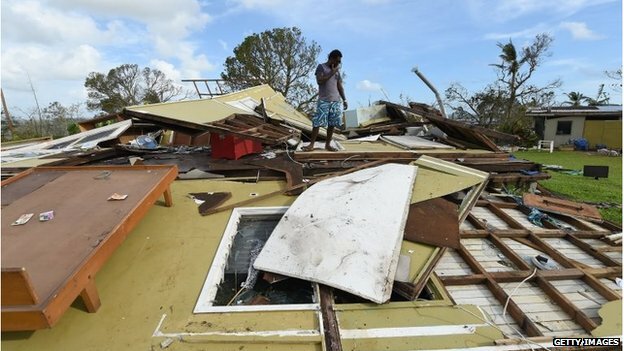 Hearts go out to the people of Vanuatu – Thanks for NZ Rotary link Paul. Fortunately it stayed 100km of the coast of Fiji. Met Office staff (in Nadi) were watching it with doppler radar and said they had never seen anything like it.